We’re big fans of OS X email client Sparrow. It’s a beautifully thought-out app that is the closest thing you’ll find to an official desktop client for Gmail, with seamless support for many of Google’s email features like archiving and labeling. Now the Paris-based team behind Sparrow has rolled out a new update that integrates another favorite app amongst the TNW team, Cloudapp. In case you’ve missed it, Cloudapp is a simple way of storing and sharing all sorts of files – you can just drag a file to the icon on your OS X menu bar, it’s uploaded and a URL is added to your clipboard for you to paste wherever you want to share the file to. A Web-based interface then lets you browse and share all the files you’ve uploaded. With Sparrow version 1.4, which has just hit the Mac App Store, you can connect your Cloudapp account up to handle attachments. As the video below shows, when you drop any file into an email compose window it’s immediately uploaded to your Cloudapp account. 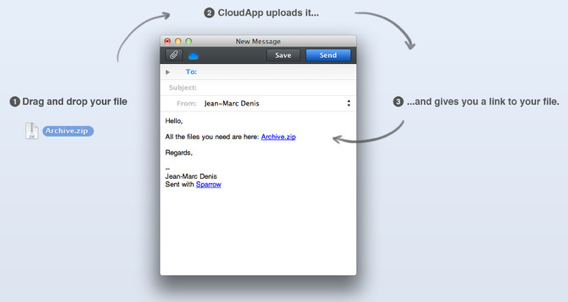 When your email arrives at its destination, it will have a URL link to access the file on Cloudapp’s servers. This is perfect for when you have large files you need to send by email multiple times – that one URL is all you need. You can still use traditional attachments by dropping the files you want to send into the bottom of the compose window or using the attachement button. Other updates in the latest version of Sparrow include support for reversed thread ordering; an iPhone-style ‘pull-to refresh’ mechanism (although we’re darned if we can work out how to use that one); UI tweaks and under-the-hood speed increases. Sparrow costs £6.99 or local equivalent from the Mac App Store, although the update is free for existing users.